The Astin Scholars Program supports the work of a select group of students who will conduct research on civic engagement for an entire academic year. Over the course of a full academic year, students integrate experience gained from an internship at a community organization with academic requirements, under the guidance of a faculty mentor. Each scholar will produce a comprehensive research thesis. The program is named for visionary UCLA higher education scholars Helen (“Lena”) and Alexander (“Sandy”) Astin to honor their nationally recognized body of research in the area of civic engagement. Administered by the UCLA Center for Community Learning with inaugural funding from the UCLA Foundation, the Astin Scholars Program celebrates the work of community-based undergraduate researchers committed to civic engagement. The Center for Community Learning joins the greater UCLA and higher education communities in honoring the life Helen S. (Lena) Astin. 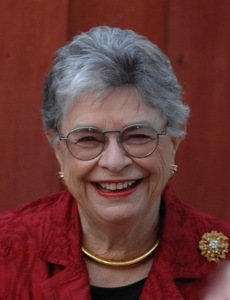 Lena was a pioneer in the research of student experiences while in college, specifically on issues related to women, equity, spirituality, and civic engagement. She was a prolific writer, having authored 14 books among her vast accomplishments in a career that spanned over 50 years. But to the students who have been chosen as Astin Civic Engagement Scholars over the last 7 years, Lena personified what an educator should be: someone who deeply cared about students. Her insight, encouragement, and warmth were tremendously meaningful for these young scholars learning how to incorporate their passions into rigorous inquiry. And the feeling was mutual — Lena always had a big smile on her face while listening to the students talk about their research. All of us who knew and worked with Lena have been honored by her company. She will be so greatly missed. Our thoughts go out to Sandy, their children, and their grandchildren. To learn more about Lena’s life and career, and to share your own memories of her, please visit the Higher Education Research Institute’s Tribute to Lena. The family has requested that in lieu of flowers, donations in Lena’s memory be made to UCLA’s Astin Civic Engagement Scholars Program . As you know, civic engagement is one of UCLA’s high priorities. So I am pleased to announce an innovative new program that provides scholarships for undergraduate students who participate in civic engagement research with a community partner and a faculty mentor. With funding from the UCLA Foundation, we have created a Civic Engagement Scholars Program, which builds on UCLA’s success in providing an academic context to develop students’ passions, interest in public service and leadership skills. The program will be administered by the UCLA Center for Community Learning and is named for emeriti faculty Helen S. and Alexander W. Astin. The Astins are visionary scholars with deep UCLA roots and are widely recognized for their seminal research on how civic engagement experiences enhance undergraduate education. Please inform students about this scholarship opportunity. Applicants must have a cumulative GPA of 3.25. As the Executive Director of a poverty relief organization in Los Angeles, you have been given unlimited funds to address poverty in your community. Please describe how you would lead your organization in taking on the issue of poverty from a systemic perspective Please submit your answer in no more than 500 words. Email the completed form to Dr. Doug Barrera . Dr. Barrera is happy to meet with any prospective applicants to discuss their research ideas.